Product prices and availability are accurate as of 2019-04-19 01:37:21 UTC and are subject to change. Any price and availability information displayed on http://www.amazon.com/ at the time of purchase will apply to the purchase of this product. Sargent 351 series door closer is user friendly versatile mounting applications permit standard, top jamb, parallel and track installations. Self sticking templates supplied for most applications. One door closer body for all applications. High impact non-corrosive plastic covers with two machine screws standard, metal covers and lead lined are optional. All weather fluid allows closer to operate effectively in extreme temperatures without readjustment. 1-1/2-inches diameter piston for superior door control. Standard pressure relief valves for both opening and closing cycles protect the door and frame from damage caused by abuse. Heavy duty construction. 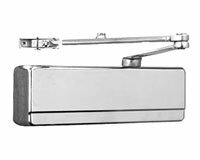 Heat treated full closed rack and pinion provide control from the full open position. 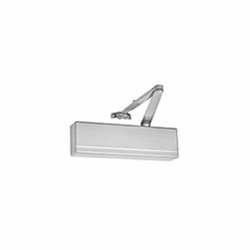 Heavy duty one piece die cast aluminum silicon alloy body with 14 percent silicon provides superior strength and wear resistance. 1/2-inches arm engagement over a 7/16 square spindle ensures a wear-resistant tight joint. Fasteners: machine screws and self tapping screws provided for closer and arm. In addition, wood screws supplied when installed on wood doors without through bolts. Valves: brass body low sensitivity control valves offer separate regulating for door speed, latching, back check and optional delayed action. All valves are controlled by an 1/8-inches allen wrench to discourage tampering and are captivated to prevent removing valves from the body and damaging door closer. 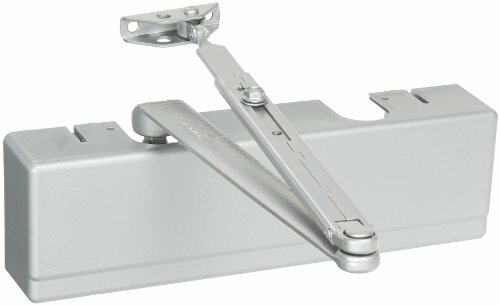 Adjustable back check (standard) protects the door and hardware from damage during the opening cycle. Adjustable delayed action (optional) permits easy access for physically impaired individuals. Valves are captivated to prevent accidental removal. Certified ANSI/BHMA A156. 4 grade 1. Conforms to UL10C and UBC for positive pressure fire test. UL listed and cUL listed to Canadian safety standards listed for use on fire doors. 25 year limited warranty.